Please enter the name that you want on the puzzle. Also if you want the letters separate or touching. A perfect tool to help teach children to learn their name and also aids and promotes manual dexterity! 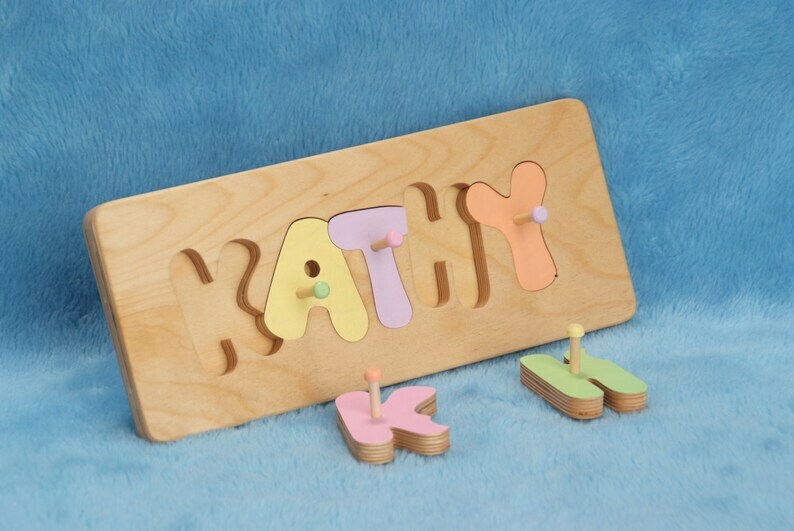 Each letter of the Puzzle Board is brightly painted with safe, non-toxic paint. In your choice of Primary or Pastel colors or left natural (No Paint). These puzzles are sanded to have rounded edges & corners. Sturdy handcrafted construction with a non-toxic finish. Makes a delightful gift for birthdays, holidays or any special occasion. Name Puzzle 5" W x Length varies depending on number of letters in the name. Maximum 10 letters per name. Also the puzzle can be made with the letters separate as you can see in the pictures. Please specify when you place your order. ANY QUESTIONS PLEASE CONTACT US!! My Godson loved his puzzle. I recommend getting the knobs which will make it easier to play with. Thanks for the great product! It is amazing!! The shipping came very, very quickly! Thank you so much - it turned out absolutely perfect. My granddaughter loves having her name on this puzzle. She is learning to recognize the letters in her name. Workmanship is wonderful.